"LIFE IS A CITY OF CROOKED STREETS, DEATH IS THE MARKET PLACE WHERE ALL MEN MEET"
It was a key site to protect the channel sea ports and associated shipping lanes, and a good point to advance from to seize Ostend and prevent the Germans using this key port to launch U-boat attacks (Third Ypres). Due to the gallant bravery of saving the town from the Germans in 1914 (First Ypres), against overwhelming odds, the town became of symbol of defiance. Following the failure of the Schlieffen Plan, the Germans decided that the decisive blow would now be to take the Channel ports. During this early period of the war the only troops at Ypres were the Yeomanry of the Queen's Own Oxfordshire Hussars (there under the intervention of Winston Churchill). Until the arrival of the British 7th Division they were the only troops between the German army and the Channel ports. The Germans did actually manage to enter Ypres and a few local villages, before being forced back onto the ridges around Ypres, by the arrived of the British 7th Division. The Ypres area at the time was often described as being like a saucer, with the town of Ypres at centre where the cup sits and the surrounding land being the saucer rim. This gives a very good indication the advantages the Germans would of had for the greater part of the conflict in this area. Click map for full size map of Ypres sector. These battles are further broken down to specific action in particular area. The First Battle of Ypres (12th October - 22nd November). Here we had the poorly equipped and out numbered (over 2:1) British Expeditionary Force (BEF) facing the might of the German army. A classic example of the bravery of the BEF is shown by the action that took place on 31st October, north of the Menin Road the 1st Scots Guards, 2nd Welsh Regiment and 1st South Wales Borderers were fighting it out in Geluveld Chateau grounds, and although the Welsh had only eighteen working riffles the line was being held. Reinforcements were called for and this came in the form of the 2nd Worcesters, the 357 men of the Worcesters with the Scots and South Wales Borderers charged the Germans, taking them by surprise and halted the Germans march on Ypres. This action alone probably saved the town of Ypres. The battle that followed saw a change in type of warfare from one of mobile infantry and some cavalry of the static war of trench warfare. 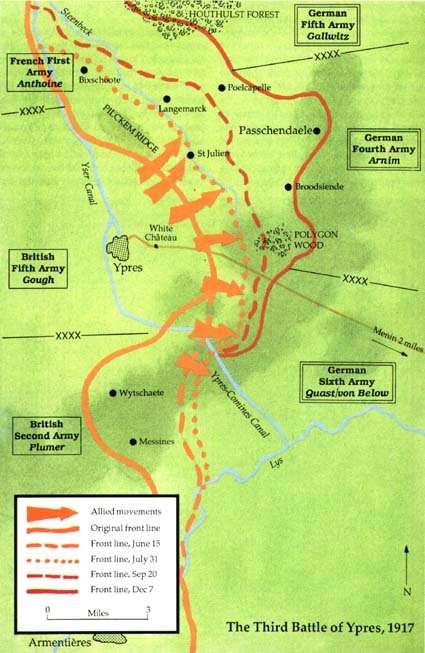 The first battle saw the Germans trying to break through the British defences to take Ypres. During the battle the BEF had almost ceased to exist, by the end of 1914 some 90,000 (or 90%) of the original BEF were casualties with 30% dead and so the cause was set. The Second Battle of Ypres (22nd April - 25th May). The British army used the "relative quietness" of the winter to regroup for the forth coming offences, 1915 saw the introduction of two new forms of warfare. Firstly there was gas, which signaled the commencement of the Second Battle of Ypres. Secondly flamethrowers ("liquid fire") at Hooge (30/31 July), although strictly this action is not part of Second Ypres it does give some idea of what is meant by "relative quietness" in the Ypres sector. Therefore on the 22nd April the Germans released chlorine gas from thousands of gas canister on a wide front north east of Ypres in the area of Langemark, worst affected were the French colony troops who deserted their trenches and fled back towards Ypres. Fortunately for the allied to Germans were slow the seize the opportunity presented to them, little realising the way was open right into Ypres, Canadian troops closed and held the trenches in the area with support from the Geddes detachment. The Canadians bravery is commemorated by a memorial at Langemark. The battles raged on from another month mostly in the north and east of Ypres, during the period the Salient contracted through both tactical withdrawals and defeats, however the town did not fall. During April the Germans launched the "hate shoot" campaign on Ypres reducing the town to rumble. In holding Ypres the British suffered 60,000 casualties, the Germans an estimated 35,000. During the following years the main offences were elsewhere, the Somme and Verdun, however during this period the Ypres Salient saw many bloody battles. The Third Battle of Ypres (31st July - 10th November). Although not part of Third Ypres the preliminary action in the south, known as the Battle of Messines, was stated as being the most successful campaign of the war. The aim was the taking of the ridge from the Germans. This ridge commanded good visibility of the surrounded areas and allow the Germans to overlook the British positions. Extensive preparations (starting back in May 1915 with the idea of J Norton-Griffiths) were made with 19 mines (933,200lbs of ammonal) being exploded along the ridge from Hill 60 in the north to Ploegsteert in the south at 3:10am on the 7th June, with an artillery bombardment of 3,250,000 (144,000 tons) shells from 2,250 guns, the attack was a complete success with very few casualties and went to show that the careful planning paid off. It was six weeks later that the Third Battle of Ypres commenced. Following a huge allied bombardment from the 16th to 31st July (with over 4 million shells) the battle began. The attack would make use of Gough's new (and relatively un-tested Fifth Army). The orders to advance were given and the attack moved off at 3:50am on the 31st July 1917 in heavy rain (in fact the rain was to play a major role in the campaign, as what lay ahead was the wettest Aug to Nov periods on record). The first day saw most objectives taken, however at a cost, with 15,000 casualties, rising to 31,850 by the 2nd Aug (with 12 VC's being won), all for a penetration of about 2-3kms. This pattern of high casualties for the taking of little ground was to be repeated throughout the summer and autumn. Passendale was finally captured in early Nov 1917, but at massive cost of 270,000 casualties. The battles of Third Ypres are classic examples of the advantage of defence, one which should of been learn after the Somme the previous year. The Fourth Battle of Ypres (9th April - 29th April). This battle involved an offensive launched by the Germans, using troops released from fighting in the East, following the Russian Revolution. The idea was simply, to crush the allies before the arrival of the Americans. The action started in the Somme moving up to the Ypres sector. The allies came very close to losing Ypres, the British commanders (Plummer and Haig) contemplated withdrawing to a line at St. Omer, but the Germans halted temporarily giving the allies time to re-group. The Final Breakout (28th September - 19th October). The final breakout utilised the same ideas as in 1917, but the Germans lacked the strength they had then and the breakout was achieved in two stages. By the day of the Armistice the British Army were 51 miles from the Salient.